#MyBestFriendsWedding, Chapter 3: The ProMOHsal! Guys. It happened. I’m still so excited I can barely contain myself… My biff Michelle asked me to be her Maid of Honor!!!! I wanted to share this with you all because 1. This legitimates this series even more since I’ll be documenting every moment of the journey as I #makeallthethings in my official role as crafty MOH and 2. I really think Michelle made the most meaningful boxes, so I just have to show y’all how amazingly she did! So, the box-opening moment – ah! My adrenaline was rushing. Michelle’s mom, Marta was looking at me and smiling so I was super anxious and then bam. I saw the words and started jumping! Now let’s go into the BEAUTIFUL stuff my biff got for us. As you may have seen on the interwebs, the “Will You Be My Bridesmaid?” boxes are very in right now, and a lot of them have the same few items: a small bottle of champagne, a nail polish, maybe some jewelry with a knot in it (a “help me tie the knot” reference), and some other random item. Michelle wanted to do something different, and she KNOCKED it out of the park! The boxes totally go with the rustic vibe of the engagement party and wedding! The beautiful customized items she ordered for us! The color palette for our bridesmaid dresses, as she wants an ombre display! 1. A picture of her and each bridesmaid in an adorable frame. 2. The “Rosé all day” gummies from Sugarfina. 3. A customized golden pouch with our names on it. 5. The color palette preview of our dresses! Super adorable little tux boxes for Brian’s groomsmen! FYI – Brian’s boxes were also a knockout. He included a flask, the Cuba Libre gummies from Sugarfina as well, and a wooden bottle opener you hang on the wall with the guy’s initials engraved on it. BOSS GROOMSMEN! Bring on the MOH duties sonnnnnnnnnnnnnnnnnnnnn! Now that my best friend got engaged, I am the happiest crafter alive, and I’m ready to make ALL of the things. First stop: engagement party central! My biff (that’s what we call each other :P) Michelle, like most women, has had an idea of what she wants her wedding to look like, so her mom Marta and I are going with a similar feel for the engagement party. The rustic vibe is very in right now and she likes it a lot, so let’s get to it! 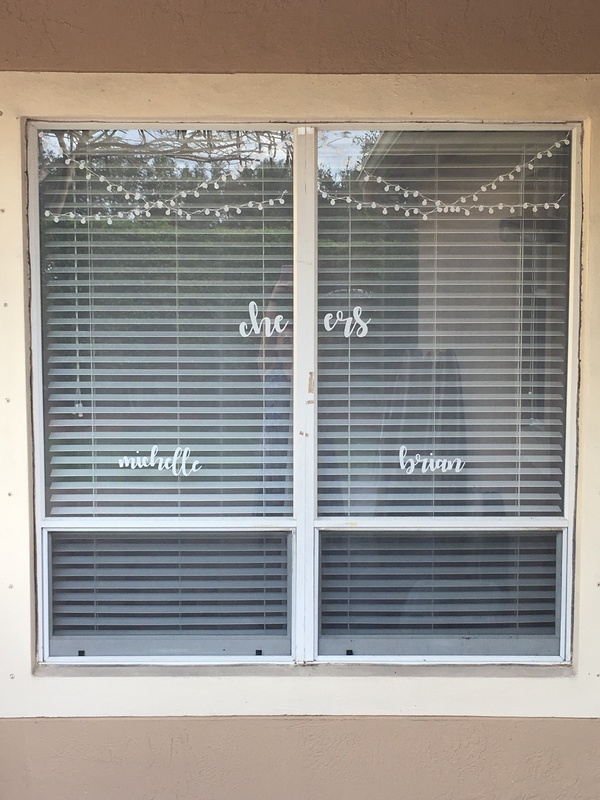 Michelle’s parents have a beautiful home with a great backyard where they’ve hosted lots and lots of parties, so we know the space pretty well and have an idea of how to set things up to maximize each area. This Pinterest board has a lot of the inspiration for the stuff I made for the party, so let’s dive right in to the final products! The decor: I’ll wrap a few of the items into this category so this doesn’t end up the long testament my blogs usually are hehe… Our color palette for the party was Blush Pink, Taupe, Ivory & Rose Gold. Lots of burlap, lace, and a vintage classic vibe made everything really pretty and Pinterest-y! The food table, set up by Marta’s interior designer friend! I actually broke one of those white plates, because me and clumsy go together like PB & J! The photo booth & props: Brian (Michelle’s fiance) is very handy, so Marta and I asked him to build a rustic-looking frame that we could drape and place in the garden to create a photo booth area. Brian did such an amazing job that I almost didn’t even want to dress the frame, but at the same time I’ve been loving the mixture of delicate with rustic/industrial so with his part done, it was time to make it pop. The fabric Marta found for the frame was shiny, shimmery & splendid. I also did a “she said yaaasss” banner, and added some vintage bulbs and baby’s breath to make it all come together. To finish the look, we hung a bunch of mismatched lamps from the tree, and it all looked beautiful both during the day and at night! For the props, I wanted to do something different from what I always do, since after all, props are kind of my niche… I actually started to design a completely different idea from what it ended up being, but I’m super happy with the end result. I used burlap paper, designed the props on PowerPoint, printed them out, cut & glued them to cardstock for hold and voila! Awesome props to complement an already great photo booth area! I got really visual with these, and I wanted the prop shape to reflect the prop message. And such realistic looking paper! At night, with all the lanterns on, this was the perfect romantic backdrop for everyone’s pictures! The favors: I didn’t get any good pictures of the final product here, but long story short: plastic bags, burlap strips, circle “Brian POPPED the question, Michelle said yes!” tags, popcorn. You get the idea! The calligraphy: boy oh boy do I hate my handwriting/penmanship. I’ve always wanted to have pretty handwriting, but it’s just not in my skill set. I can pull off a few tries but I hate writing slowly and when I go fast, there’s no way to control the strokes… So when Marta showed me the boards and table tent signs, I kind of swallowed hard and said ok… I got this! I did those the night before the party, and I was so stressed the entire time. If I’m honest, the first tent signs didn’t come out as good as the last ones. It’s true what they say, calligraphy is a practice thing. Although some people are just born with those magically beautiful calligraphy skills! Marta found a packet that brought 5 of these tent double-sided signs, which was perfect because there were 5 tables. So I had to write the hashtag 10 times… I was trying to replicate the Autumn in November font. Not the worst I’ve done! Ohhhhh the way the light hits that rose gold is a poem! The whole combo. Mix & match is so fun! We picked out that lace and burlap ribbon as well as the flowers ourselves! Haha. Every time I look at this, I laugh even more! PS: Oh and one last thing – this was something new I decided to try: window cling! I wanted to make something for the bar area, so I went with some string lights, a “cheers to michelle & brian,” and that’s all she wrote! For real this time! I added a heart with a “to” afterwards but this picture is where the window cling shows the best! My best friend’s engagement party on April 29th, and all that that entails. A good friend of mine asked me for props and a big frame for her best friend’s engagement party, also on April 29th. My best friend told her boss about my crafting, and she asked for some big items for her son’s birthday party, also on April 29th. Vanessa’s wedding items, needed for May, but still. This post is specifically about the props for the other engagement party that’s on the same day as my best friend’s. Let’s get to work! Meaghan is a good friend from college, she’s currently living in Orlando, but her best friend Mary lives down here. Meaghan just helped Mary’s boyfriend propose to her, and now the engagement party is in the works. This is probably the simplest order out of the bunch (thank you Meaghan!) but it’s still very important to me to do it well and get it all done with time so that there isn’t crazy pressure to finish multiple orders together. A set of props in black and gold to go with the color scheme of the garden-themed engagement party. A big ring frame, in rose gold to reference Mary’s engagement ring, based off of one Meaghan saw on Pinterest. Meaghan gave me free rein on the prop design, and when I sent her the digital proof she approved so I got to work with glitter card stock galore. The YAS is strong this year! Me too prop, me too. After I was done with the props, I got to work on the ring. Besides making sure the final contraption would be sturdy enough, I had another issue: rose gold is just starting to become widely available in many materials, so unfortunately there were no big poster boards to use, but rather long strips of card stock. I let Meaghan know that there would be a line where the cards met on one side (the other would be covered by the ring silhouette) to make sure she’d be ok with it, and she gave me the green light. I mixed solid card stock with glitter card stock for the “diamond” and Meaghan absolutely loved the outcome! You can see the line of the cards meeting in the bottom in direct opposition of the diamond point, it totally wasn’t a big deal, but I wanted to warn Meaghan nonetheless so she’d know in advance. Now that these are done, let’s get on with the other three orders before I have a panic attack! 2014 is definitely the year that brought me back to doing events – and I’ve loved every single one. I’ve planned/crafted for/set up a baby shower, a bachelorette, a few birthdays, a baptism, and a couple of other things here and there, but one of my favorites definitely has to be this proposal. I’ve known Jill and Jorge for about five years now, and they’re one of the most adorable couples ever. They have been together for eight years, and a lot of that time was spent apart, living in different states or cities. Once they were finally in the same zip code, our group of friends jumped for joy. At some point in late February, Jorge reached out to me with an idea for a beach proposal, and he had a date: April 12th (because Jill’s grandma would be in town). He drew up a sketch of what he envisioned, and let me run wild with it. He originally wanted to propose at Sunset Pointe or Ft. Lauderdale beach, but there was an event that weekend, and we had to look into other options. I had been to the Anglin’s Fishing Pier at Lauderdale-by-the-Sea once before, and I thought this would be the perfect place for the event, so we had a “site visit” and he was on board. Since this proposal involved our whole group of friends, I held a crafting session for the girls so we could work on the signs and other props we would need. Everything was exactly what Jill wanted. Her cousin was also in on the planning, and she helped us refine the details to make it perfect for Jill. I also had the very nerve wracking duty of capturing every moment, and I definitely felt the pressure to capture everything and not miss a single beat. Without further ado, here are a few shots from one of the most emotional proposals ever! 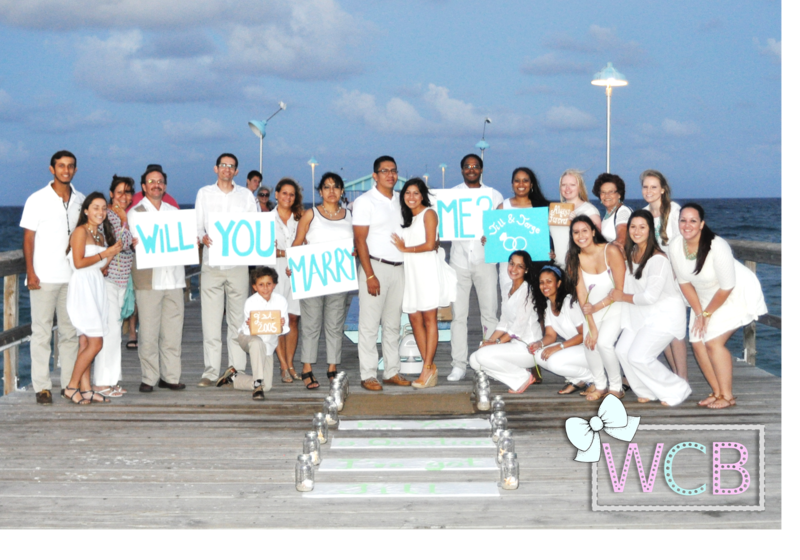 And finally, our whole group got together for a pic with the newly engaged couple!